Since 2012 South Korea’s top 10 family-controlled conglomerates have spent more on gifts and entertainment to secure business deals than on marketing, according to their balance sheets. The data, which was compiled by the Superrich Team, revealed that out of the 584 affiliates under the 10 conglomerates, 456 companies released regulatory filing showing that they spent more than 30 trillion won on gifts or entertainment. The spending refers to all expenses on gifts and entertainment for the purpose of securing a business deal. Some companies claimed to have spent zero on entertainment and instead filed the money under “other uses,” which is virtually impossible to confirm. Subsidiaries from retail giant Lotte spent 85.5 billion won, the largest amount for gifts and entertainment expenses, during the four-year period. SK affiliates came next with 70.3 billion won. Their annual spending on gifts and entertainment grew from 16.4 billion won in 2012 to 18.4 billion won in 2015. 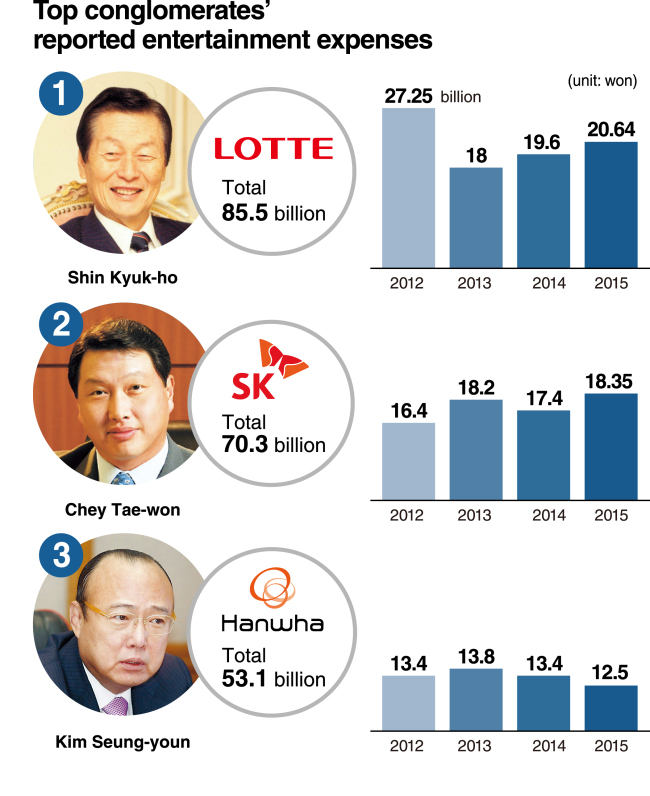 Hanwha, under CEO Kim Seung-youn, ranked third with a total of 53.1 billion won being spent over the cited period. 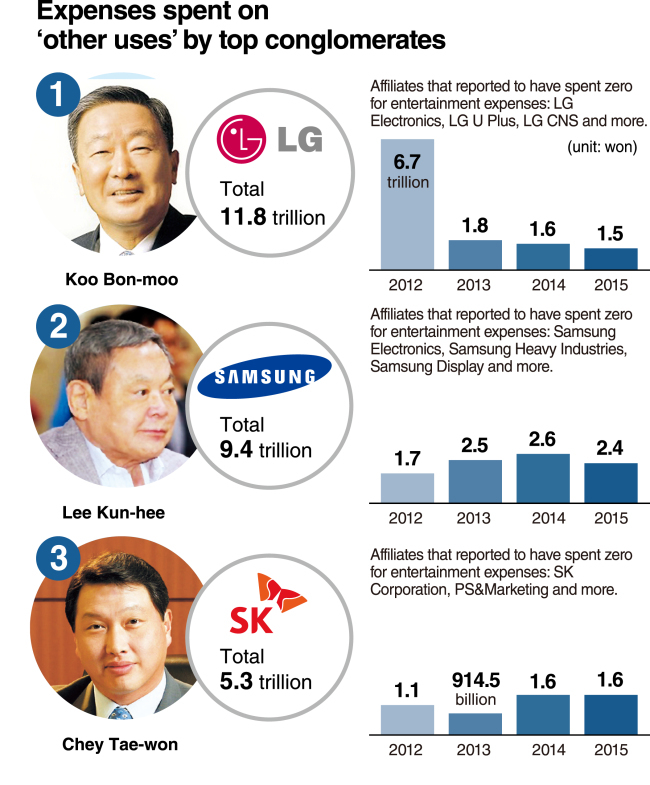 Samsung and LG followed with expenses of more than 40 billion won each on business deals. Of those that said they spent zero on entertainment expenses -- but with a hefty amount categorized under “other expenses” -- LG topped the list with 11.8 trillion won. LG Electronics, LG UPlus and unlisted unit LG CNS did not have anything listed as gifts and entertainment spending. Samsung ranked second with 9.4 trillion won in “other uses.” The group reported that its several units including Samsung Electronics, Samsung Heavy Industries and Samsung Display did not draw up a budget for entertainment expenses. SK had 5.3 trillion won in undefined spending. Hyundai Motor Company spent 2 trillion won in the unknown category. During the same period, its units, including Hyundai E&C and Hyundai Motor, reported no entertainment expenses.